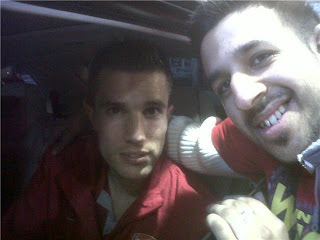 Akhil From Hounslow: Is Robin Van Persie just a luxury player or still an important part of the team? Is Robin Van Persie just a luxury player or still an important part of the team? This blog was written a while ago when I had issues with a certain website not letting me write for them, so therefore, I did not publish this on my personal site, some of you may have read it elsewhere though as other sites did have it. With all the call up issues with Robin, I thought it’s a perfect chance to post this again. In six seasons he has appeared in 131 games from a potential 228 games in the league. Last season in particular he looked the ‘real deal’ and was scoring and providing goals for fun but that ended as the injury jinx struck again. Robin Van Persie on his day is a world class player. His technical ability is one of the best I have seen at Arsenal and in world football generally. He contributes with goals, assists, takes corners, takes free-kicks and is involved in most of the positive things Arsenal do when going forward. Robin is one of them players that can create something out of nothing. That amazing volley against Charlton is a great example or popping up a few years ago to score the equaliser against Manchester United at the Emirates (even though he broke a metatarsal in the process). Last season for me was the time where I saw the real Robin Van Persie. I KNOW I am not alone in thinking that if Robin Van Persie was fit most of last season, we perhaps would be Champions of England right now. The period where I believe we lost the title was when we were playing without a proper centre forward. With Van Persie there, it may have been different. On a personal level, having met Robin a few times and been present in a question and answer session with him, I can tell how highly he rates this club. I remember one question that was asked, it was about if players get distracted when speculation about a possible transfer is in the media, the answer for him was simple; ‘if you do not want to leave then it will never distract you, I have never wanted to leave and therefore am not distracted’. The answer was refreshing and looking at how football is in regards to money, it was very pleasing to hear a big player speak like this. I feel for Robin because he is desperate to play and wants to win things with this club. However, when a player gets so many injuries every season, how long can you rely on a player who misses big parts of the season? Many have said its time now to treat Robin as a luxury player so to speak, and not expect him to play but when he does, it is a bonus. Last season we saw that missing Robin was a massive blow and left us playing without a proper centre forward for around three months. This time around, we have Chamakh who can also lead the line himself and with Bendtner coming back to full fitness, we seem to have more options. The debate of if we will play two centre forwards when Robin returns may not need to be answered just yet but with Robin back, Mr Wenger can pick and choose the games he wishes to play Robin in and this could benefit Arsenal football club. I think it’s important to see how Robin comes back from this injury because after missing such a long part of last season, he will be desperate to come back. However, we must be patient with him but also protect him, so I personally do not expect to see him in the starting line up as much as we would like. Even if he just plays the games against the top 9 clubs in the league, I think it could be enough to make the difference. It is a very hard one to call because playing one match here and there does not give much continuity; however, I am not sure if we have the choice. One thing for certain is that I do not want to see Robin Van Persie leave this football club because he has Arsenal in his heart and I have seen this with my own eyes when talking to him and seeing him live on the pitch. Just hope he comes back and has a good season because with Van Persie in full flow, Arsenal DO have a chance in all four competitions. Nice read! Very stupid of Van Marwijk to call him considering it's only a friendly. But I love how well Chamakh has filled in his shoes. Player of class but legs of glass unfortunately. Well put, Its such a big shame about his fitness. The Call up is totally stupid. No logic and sense. Disgraceful. What if RVP refuses to join up with the dutch squad this time around?? They gonna ban him huh!! haha nah i talked about that a few weeks ago. I think Mr Wenger will look after him more this time round because he can. Last season he couldnt but with Chamakh we can this year. For me, he would be about 100 goals scored for the team. I just love watching him play, more than any other of Arsenal players. Additionally he's one of our best freekick taker and much more reliable with penalties than Fabregas. yeah he is, great with set pieces and just generally can do anything and score a goal out of nothing.